Teamed with Aruba and Bonaire, Curacao is one of the three “ABC” islands of the Lesser Antilles in the Caribbean. 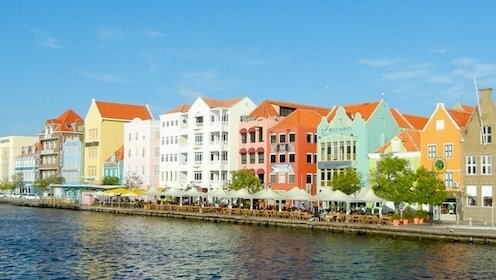 As the largest and most populated of the Netherlands Antilles, Curacao has the most going on and the most “social life.” The island capital, Willemstad, is a bustling city with brightly colored Dutch architecture, and its Old Town area is a designated World Heritage site. From shopping, casinos, and museums in picturesque Willemstad, to the picture perfect beaches of Blauwbaai and Daaiboo, it’s no wonder this island grows in popularity every year. You can use this travel guide to plan your trip and meet the locals. There are a lot of resorts on the island but once you leave the resorts, you’ll find a lot of delicious restaurants and more interesting activities. Accommodation – You can expect to pay about $25 USD per night for a dorm room in a hostel and about $50-70 USD for a private single or double in a bed and breakfast (or from a rented room) in a guest house. Hotels start at $90 USD a night. Food – Curacao has many upscale restaurants, but for travelers on a budget there are also many fast food chains and American style eateries. Sandwiches, burgers, and other cheap Western food cost about $10-15 USD per meal. If you can, stick with local cuisine, especially at the markets. My favorite spot there is Grabia Di Dios. For meals at the resorts or fancier restaurants, expect to pay $30 USD or more for an entree with a drink. Transportation – A taxi from one end of Willemstad to the other will cost around $10 USD. Taxis from Willemstaad to Mambo beach are about $30 USD. If you’re going to other points on the island, expect about $50 USD. Buses are reliable, just about $1 USD for a single fare to most parts of the island (take note though – buses outside the Willemstaad area run very infrequently). If you can rent a car, you can expect to pay $30 USD per day. Activities – Like most Caribbean islands, Curacao is popular with divers, snorkelers, and fishermen. These kinds of organized activities cost around $125 USD. The Christoffel Park entrance fee is $12 USD and the Sea Aquarium is $21 USD. Have a bbq – BBQ-ing on the beach is a popular local activity and can help you save a lot of money on food. Skip the taxis – The taxis here are very, very expensive. They should be avoided at all costs. Rent a car — Getting your own set of wheels is the most economical and convenient way to get around to the far parts of the island. Not renting one was my biggest mistake when I visited Curacao. Use Airbnb — Rental sites like Airbnb or VRBO offer the most affordable accommodation. I rented a room in the main town for only $60 USD a night (for two people). It was far cheaper than a hotel. Christoffel Park – Rent a mountain bike or walk around this expansive national park, which is filled with deer, 10 ft-high cacti, iguanas, rabbits, and rare plant life.